Earth Defense Force: Iron Rain is the next chaotic shooter from one of Japan's jankiest properties. With a slightly altered graphical style and a more serious tone (well, not entirely), Iron Rain is a "realistic" take on blowing giant ants to bits with laser beams. The gist of it is that this is still Earth Defense Force as you know it, but it's got a bit of an edge. Hopefully it provides the same dumb fun as its predecessors when it launches here in the West on the 11th April. 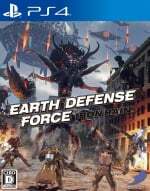 Are you a fan of Earth Defense Force? EDF! EDF! EDF! In the comments section below. Wow! This actually looks good! I love playing these games with my brother, and they're always really fun, but this trailer surprised me! This seems to be more along the vein of Insect Armageddon, which while still good I don't think is as fun as the main series games.